It was the Titanic. And ever since, we've been hooked on disasters, in general — but the tale of the great luxury liner, in particular. And the approaching 100th anniversary of the sinking has merely magnified the Titanic's fascination. There were catastrophes before that fateful Sunday night in April 1912, but nothing quite captivated the newly wireless-connected globe's attention. It was more than news. It was a macabre form of entertainment. Bigger, deadlier disasters followed, but they all borrowed from the storylines — morality plays, really — established by the Titanic's sinking: The high-profile investigations ... wall-to-wall news coverage ... issues of blame, technological hubris, ignored warnings and economic fairness — all were themes that played out in the BP oil spill, the space shuttle disasters, Hurricane Katrina, the Exxon Valdez and the recent grounding of the Costa Concordia. "The story is ageless, like all great stories," said James Delgado, director of maritime heritage at the National Oceanic and Atmospheric Administration. "The elements in this case of triumph, tragedy, and hubris, of bravery and cowardice, all wrapped up in one brief moment. That speaks to people." And to this day, The Titanic is big business in movies, books, songs, poetry, and museum exhibits hundreds of miles from the nearest ocean. Dozens of tourists have paid tens of thousands of dollars to dive in Russian submersibles to visit the ship's watery grave and see in the ocean floor "where the Titanic dug in and the ship created this knife-like sharp edge," Delgado said. For decades that burial spot was unknown, but the discovery of the Titanic in 1985 brought Titanic back to the world's attention. Then a dozen years later, another man raised the Titanic to an even greater fame with a multi-Academy Award winning movie and follow-up documentaries. This was, he said, a parable that the storyteller in him could not ignore. "It's this great sort of metaphorical novel that actually happened," said "Titanic" director James Cameron. "You can go and visit the wreck and go and see this monument to human folly." 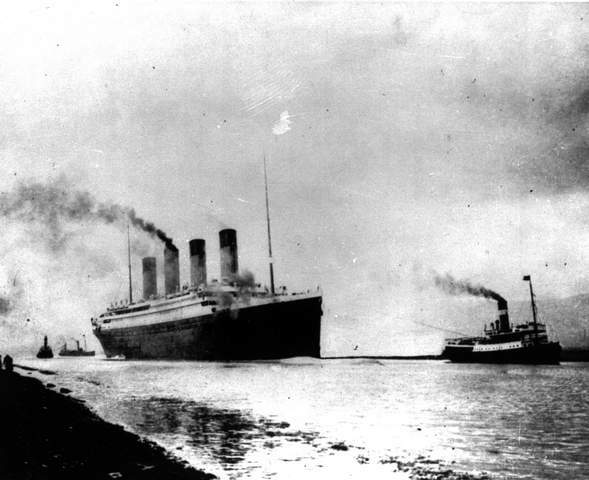 Before the Titanic, the great Chicago fire, the Galveston hurricane and the San Francisco earthquake attracted America's attention, but "the Titanic hit a nerve in a different way," said Kevin Rozario, a professor of American Studies at Smith College. "It's the dramatic quality of the Titanic." Everything about the sinking — its speed and the fact that everybody was in one place — added to the drama. In fact, the Titanic's sinking took about as long as a stage play of that era, noted John Wilson Foster, a Queens University Belfast professor who wrote several Titanic books. "The survivors did say during the sinking it seemed like a play," Foster said. The public, especially in the past century, has become increasingly fascinated with disasters, especially technological ones. That's because it helps us cope with increased mechanization, risk and deep-rooted questions about what it means to be human, said Rozario, author of the book "Culture of Calamity." He said disasters reflect everyday fears that at we often ignore. When a catastrophe happens, "we see ourselves" in the storylines that play out. And with Titanic, the storylines played out instantly thanks to the recent innovation of wireless telegraphy. Even before the Carpathia arrived in New York with survivors, the "story starts to get told in a particular way before there is any substantial information about what happened," said Harvard University professor Steven Biel. "''It's unprecedented how quickly the story goes around the world." Survivor Lawrence Beesley, in his book "Loss of the SS Titanic" said many press reports made the sinking even more dramatic than it really was. "I think it is no exaggeration to say that those who read of the disaster quietly at home and pictured to themselves the scene as the Titanic was sinking had more of the sense of horror than those who stood on the deck and watched her go down inch by inch," Beesley concluded in his book. "The fact is that the sense of fear came to the passengers very slowly — a result of the absence of any signs of danger." Beesley and others talked about how no one at the time thought the Titanic was going to go under. At first, they joked that they had to stop for a fresh coat of paint to be applied to where the iceberg scrapped the hull. After all, the Titanic was "unsinkable," they figured. "The improbability of such a thing ever happening was what staggered humanity," Beesley wrote. "That phrase 'unsinkable' became notorious," Foster said. The phrase was originally "practically unsinkable" and was from an obscure engineering journal, but after a while it didn't matter. On top of that, someone claims to have heard ship Capt. Edward John Smith say "Even God himself couldn't sink this ship," Foster said. So early 20th century society, especially in Sunday sermons, spun the disaster in religious terms — "you can't cheat God in that way," said Biel, author of the book "Down with the Old Canoe: A Cultural History of the Titanic Disaster." Every disaster inspires investigation. There were two high profile competing government probes of the Titanic. The British thought the American investigation was too hostile to the British officers and the Americans thought the British inquiry was too much of a whitewash, said Belfast's Foster. The American press went looking for a villain and found him in the owner of the White Star Line, J. Bruce Ismay. Not only did they fault Ismay for scrimping on safety, such as the number of lifeboats, in favor of luxury, but they blamed him for surviving the sinking. Unlike Capt. Smith, he didn't go down with the ship. He was chastised, much as Costa Concordia Captain Francesco Schettino has been branded a coward for leaving his ship when it sank in January. Initially, news reports told of selflessness of the rich men in Titanic's first class who sacrificed themselves to allow women and children on the lifeboats, Biel said. While there were some brave rich passengers who nobly stepped aside to let others survive, the numbers show that the poorer you were, the less likely you were to live. Sixty percent of the first-class passengers survived, 42 percent of the second-class passengers survived and only 25 percent of the third-class, or steerage, passengers lived. "It's quite often the case that the less privileged suffer disproportionately in disasters," Biel said. "That was certainly true in the case of Titanic." In the first few decades after the Titanic, the disparity in survival of the third-class passengers wasn't mentioned. It wasn't until Walter Lord revived the tale of the Titanic in his best-selling book "A Night To Remember" that the issue of class fairness was revisited, Biel said. And by the time Cameron's movie came out in the 1990s, the story had gone from the helpful rich to the mostly despicable first-class passengers. Biel said no blacks were aboard the Titanic, although others claim there was one black family. Blues pioneer Leadbelly sang of how black boxing champ Jack Johnson was denied passage on the ship: "Black men oughta shout for you, Never lost a girl or either a boy. Cryin' fare thee, Titanic, fare thee well." Survivor Archibald Gracie, in his popular account, described the lowering of lifeboats into the water with women and children, saying "it was now that the band began to play and continued while the boats were being lowered. We considered this a wise provision tending to allay excitement. I did not recognize any of the tunes, but I know they were cheerful and not hymns."